Featuring an ergonomic and lightweight design, the Handheld 3013 from Particle & Surface Sciences is Lighthouse’s newest handheld particle counter and designed for use in indoor air quality investigations. Offering three channels of simultaneous particle counting, the Handheld 3013 particle counter displays both cumulative and differential particle count data on its easy-to-read 3.8” (9.65 cm) screen. A rechargeable battery maximises the Handheld’s uptime. Data is easily downloaded using the Lighthouse Data Transfer software. 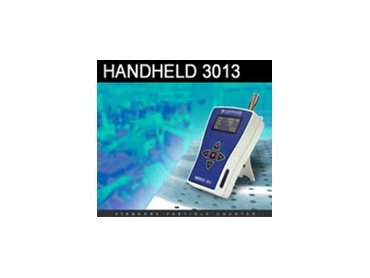 The Handheld 3013 particle counter is designed to monitor particulate levels accurately and reliably even in those ‘hard-to-reach’ areas where two-handed operation is unsafe. Lightweight - Only 1.5 lbs.